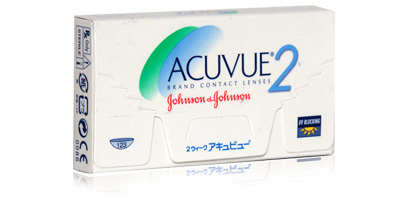 Produced by leading healthcare manufacturer Johnson & Johnson, Acuvue 2 contact lenses are one of the UK�s most popular bi-weekly disposables. Available in powers from -12.00D to +8.00D, they�re suitable for daily wear or extended wear for a maximum of six nights subject to prior approval from your optician. 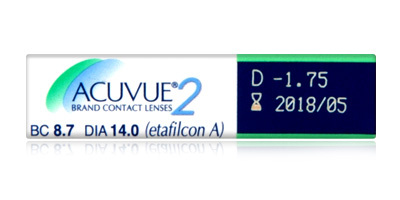 Acuvue 2 contact lenses don�t just provide sharp focus and consistent clear vision in a range of different environments and light conditions. They offer eye health benefits as well. Made from a silicone hydrogel material called Etafilcon A, these durable lenses allow up to 88% of available oxygen to pass through to the eye. This allows the eye to stay naturally hydrated and moist all day and removes the need to apply an additional wetting solution. If you�re thinking of making the switch from glasses to lenses or want to try dailies, this high performance lens is a great place to start. 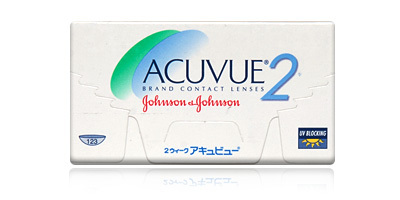 Acuvue�s useful 1-2-3 inside-out indicator makes Acuvue 2 lenses particularly easy to apply. If the numbers appear in reverse order, the lens is inside-out. Call us for advice on choosing lenses and with any questions regarding our services on freephone 0800 037 4000. Choose express delivery to have your order delivered direct to your home or work address in double-quick time. 98% of ContactLensesExpress orders are despatched the same day.